Ages and ages ago, I mentioned that I was going to do a weekend stage (clinic). Well, it wasn’t really circus tricks. We arrived at the venue and the first thing that struck me about Centre Equestre La Fenière was how well laid out it was. 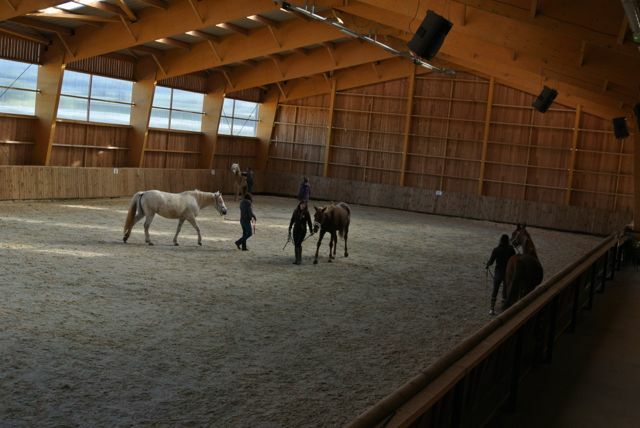 They had a huge and fabulous indoor arena, with a line of indoor stables running its length. 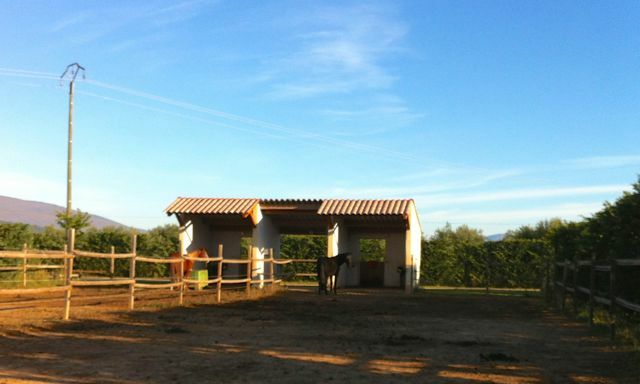 Each stable has its own attached corral on the outside, most for individual turnout, but one or two were housing horses that were obviously good buddies. Then there were loads and loads of field shelters and corrals outside, where the vast majority of their residents live, spread out over several acres. There is a very big outdoor arena, a couple of tack rooms, a sort of club-house for the resident riders and a toilet and shower block. 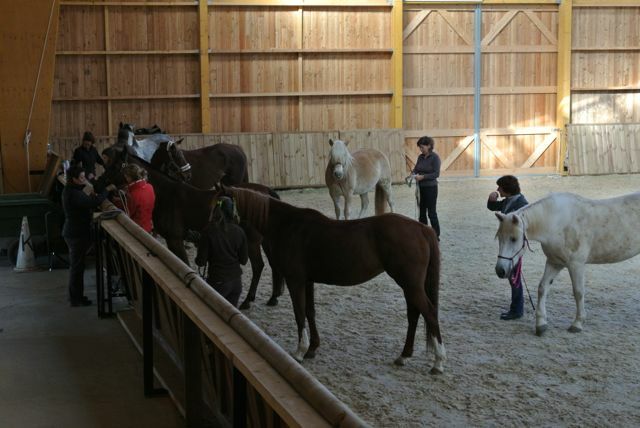 Then there is the main building, where the family live, which has a large reception area and a lovely barbecue area which overlooks the outdoor arena. I can just imagine that, in summer time, they have a great social life to go along with any of their club competitions. 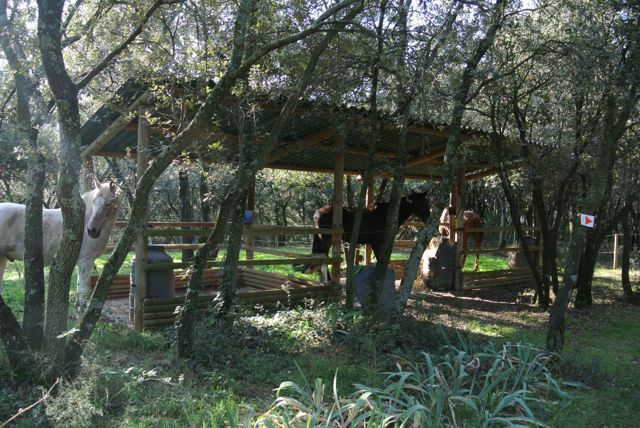 Our guys were to be lodged in a quiet spot at the far end of the site, where visiting horses usually stay – people attending camp or trekkers passing through. We led them to where we were directed. Aero was looking around, but was calm. Quieto was also very calm; Valentine was a little more excited but everyone behaved themselves very well. We turned them into their corrals and watched them settle. Or not settle. Jingle? What jingle? Where’s my hay? I was proud of him. Eventually the hunting dog (that’s what it was) ran right across the bottom of their corrals. Once the other two horses saw what was making the noise, they settled down straight away and peace and harmony was restored. We went off to meet Guillaume Assir-Becar (hereafter referred to as G) and our fellow attendees in the big reception room in the main house. There was coffee and croissants laid on and we all introduced ourselves by turn and described how much of this sort of work we’d done with out horses. It turned out that there were six who had never done it before and six who had done some of it before, so that was how he split us up. I ended up in the ‘advanced’ group, with Alexandrine and MC, both of who are way ahead of me with this stuff! The beginners went first, so we went back and checked on our horses and then meandered over to watch them. They were doing very basic leading stuff and focussing on having the horses follow willingly and stop and start without a tug on the halter. G worked his way up and down the group, advising and helping and taking over the horses from time to time to get a point across. 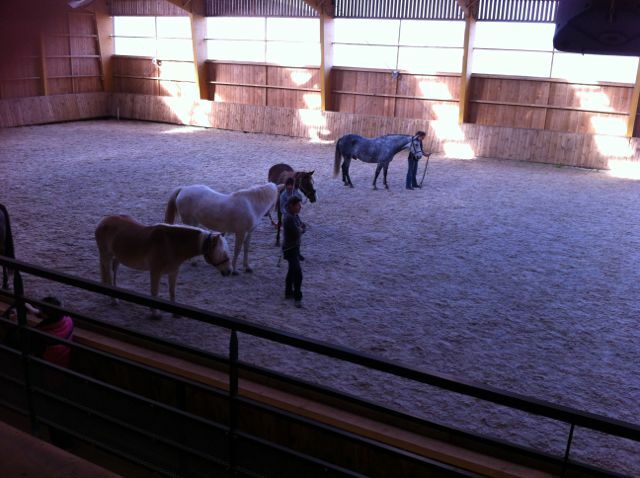 Horses and handlers seemed to be learning fast! 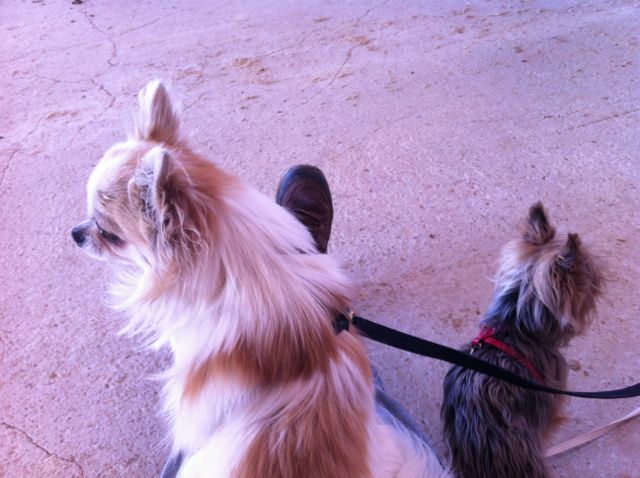 We were up soon, so we went and got our horses. I showed Aero around the arena. He wasn’t too impressed with the farthest end, so I spent a fair bit of time there, just asking him to pay attention to me and working through exercises that he found easy until he stopped worrying about the stabled horses he could see and started really paying attention to me. Once again G worked his way up and down the group. He picked me up on the way I was leading Aero and told me not to get in front of him… I bit my tongue so I wouldn’t say “I don’t normally, that was an aberration” (I couldn’t say that in French, anyway!) but otherwise he didn’t have a lot to say to me. Basically I just ran Aero through his party pieces. G watched our reverse/recall and was mystified as to why Aero likes to keep stepping backwards. It’s what he does – I say “Back” and off he goes. I say “Whoa” and stop my asking signals and he just keeps stepping slowly and carefully backwards until he’s just at the end of the lead rope. He judges it to perfection – the rope never goes taut. When he stops, it’s not because I have pulled on the rope, it’s because he knows he’s at the end of it. I think it’s just a game he likes to play, but it makes reverse/recall well-nigh impossible at liberty. He just keeps backing away! Overall, I was well pleased with his focus for the two hour session and I finished thinking, “Well I didn’t learn anything new but I’m really pleased with how good Aero has been.” It had been difficult to find space to send him off to work on a circle, I think everyone else had the same issue, because at lunchtime G was asked to break the arena up so that we could have an area for liberty work. I’ve attended this sort of training day in Ireland. Lunch is usually a sandwich and a cup of tea. If there’s an onsite kitchen, you might get sausages or burgers. Of course, France is NOT Ireland where food is concerned. We presented ourselves at the reception area. A delicious aroma wafted from the kitchen. The table where we’d had our coffee earlier was now spread with all sorts of bottles and little dishes containing appetisers. There were three huge tables set for lunch in the background – tablecloths, napkins, the works. Oh yes, the French take their food seriously. It’s at the core of every activity. Most of the attendees didn’t drink the alcohol that was on offer. I guess we all wanted to keep clear heads. Lunch was served, wine was offered and mostly refused, once again. There were baskets of bread and large bowls of salad on the tables and then the main course was arrived. Three large, round casserole dishes, with something roasted in them. It looked crisp and cheesy on top. What was it, I wondered. Lasagna? 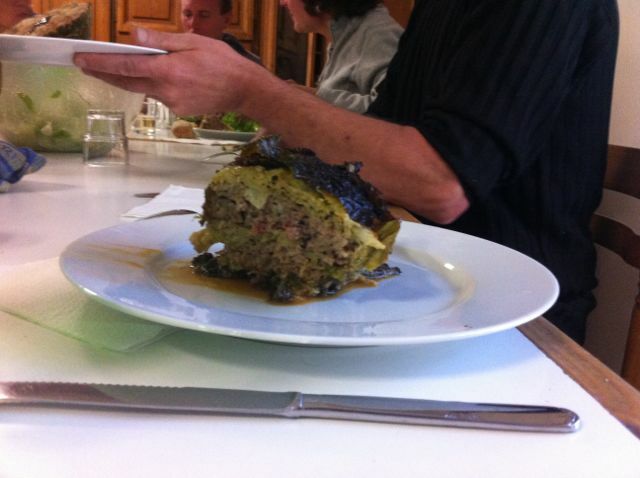 Stuffed cabbage, I was told. It tasted surprisingly uncabbage-y. The crispy top part was very tasty and the meat hid the flavour of the cabbage elsewhere. Even so, I had no problem refusing a second serving! Dessert was apple pie and ice cream. Yum. And then coffee to finish, of course. Everything was cooked onsite, in a huge, fully-equipped kitchen just off the reception area. We all helped clear off the tables and then the first group went to get their horses ready for their afternoon session. We checked on ours and spotted that there was no charge in the electric fence. Not good – they couldn’t be left there for the night. After some thought, our host told us we could move them to the livery corrals at the far side of the arena once our afternoon session was finished. They wouldn’t be side-by-side, but we assured her that they wouldn’t be too concerned at being split up – none of them are field companions, after all. I made some new friends while we were watching the first group. They kept my legs warm. And they were very, very cute. Our turn came round again. Aero settled straight away this time and we set to work. He was doing super following work and I experimented – I walked really, really slowly and he matched my pace; I broke into a run and he trotted beside me; I slammed on the brakes and he stopped with me every time. I noticed that he had a tendency to go sideways when I did the super-slow walk so I played with making that happen, so that if I stepped sideways he would leg-yield/side pass with me. I used the word ‘over’, which he’s already familiar with, to help him understand what I was asking and he was pretty good. For a new trick learned in strange environment, I thought it was great! My group took it in turn to go into a roped off area for liberty work. I was the last to get into it. G asked me if Aero would stop and turn to me. “I can try” was my answer. This is Aero’s weak spot, after all. He thinks that circle work is meant to be round-and-round-and-round-and-round and still doesn’t really believe me when I halt him and ask him to turn in to me. Well, I sent Aero out on the circle and he went off like a scalded cat. I had kept him on the lunge, anticipating problems. I reeled him in after he had ignored me a few times and looked at G. It was late in the day, our session should be finishing up… I think he could see that he wasn’t going to fix us in five minutes so he said we’d work on it tomorrow. Fair enough. We put the horses to bed and headed home ourselves. It had been a long day. 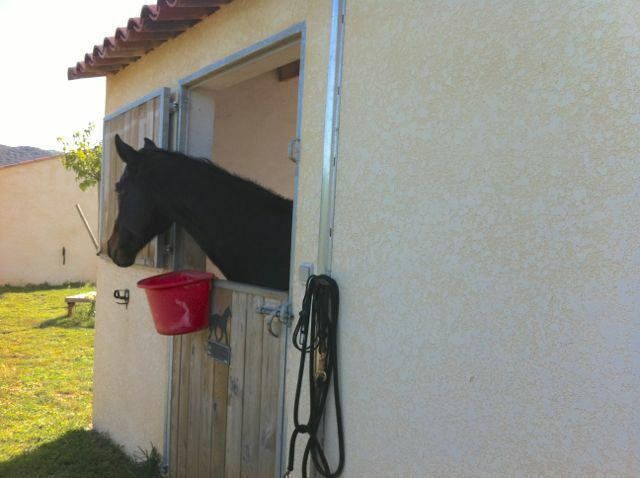 Aero in his new accommodation. It’s actually a field shelter. We were the first group in action on the second day. G homed in on me and Aero straight away. He liked Aero and he could see that he’s keen to do the right thing. I tried to explain about how he’s been lunged a certain way all his life, and that the rules suddenly changed a few months ago, but I couldn’t help thinking I sounded like I was making excuses. I always hated teaching someone who made excuses all the time! G took Aero’s rope and sent him off. When asking Aero to stop, he wanted Aero to turn and come in on command. He got him to do it a couple of times; then I took over. We were getting the hang of it. We’d been working on a circle for ages, so I changed and started doing other things. Then G arrived back and asked me to demonstrate our ‘turn and stop.’ “Bon” he said. But now we had to learn how to change direction on the circle without stopping. He made it look easy. Horse trotting around, step forward, swing the whip in front of him, turn your shoulders, kinda swing the lead rope and send him off the other way. It looked a lot like a dance move to me. I’m blessed with two left feet. I really, really struggled with this. It wasn’t Aero – he did it fine for G. No, it was my lack of coordination that was causing us trouble. Sometimes Aero speeded up when I asked for the turn. Sometimes he thought I was asking for a stop. G came back and corrected me. Things got a bit better. I was left alone. For ages. Still working Aero on a circle. He was bored; I was bored. Enough, I thought. I’m going to go do something different. 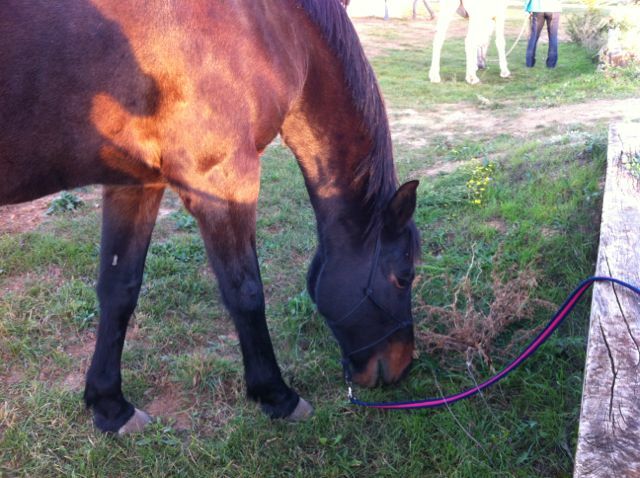 We went off and worked on his follow, with him trotting after me at liberty, the rope tied around his neck. G arrived back with us. He asked how was the circle work. I said I felt we’d done enough on a circle (probably over an hour, but not non-stop). D’accord, he said, OK. How about teaching Aero to respond to a reverse command from behind? He’s good at reversing anyway, he’ll probably pick it up quickly. 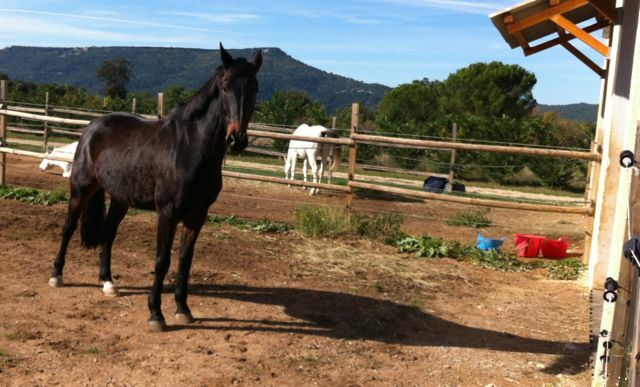 The aim is to stand behind your horse, lift your whip over his back and the horse will step backwards. You keep stepping backwards, with the whip raised and the horse follows you. He should stop when you lower the whip – or say whoa! You start teaching it while you stand at the horse’s shoulder, with the horse standing by the wall so his options are only forward or backward. Touch on the top of the shoulder and back up the signal with a tug on the lead rope or a voice command (Back) if necessary. A couple of steps is all you want at first. Lots of praise and/or carrots when the horse gets it right! Gradually you change position, so you end up by the rib-cage, then by the hip and eventually behind the horse. I’m happy to say that Aero picked this up straight away. It’s definitely a new party piece. I still have trouble getting him to stop though! Lunchtime again, and another feast. Fish pie, this time. I’m not a great fish lover either. I swear I’m not a fussy eater, it’s just green veg and fish are not my thing! Anyway, lunch was fun, we chatted a bit more easily this time. A couple of people relaxed and had a glass or two of wine, but I wanted to keep my wits about me in case there were any more dance moves to learn! The beginners group were first to go after lunch because two of them had to leave early. They had come on in leaps and bounds. Many of them now had their horses following well at liberty and they were working on circles, backing up and negotiating obstacles, like a small jump and a tarpaulin. It was our turn to go. G wanted to see Aero’s turn on a circle, which I did manage to make happen (thank goodness I’d stayed off the wine at lunchtime). Our group played with the obstacles left behind by the first group. Aero side-passed across the tarp and reversed/returned across it too, so I was quite happy with him. Then G called everyone. We were to go outdoors and play on the little cross country course beside the indoor. Gulp. Would I keep Aero’s focus out in the real world? Yes I would… we went up and down a big heap of earth, fast or slow. We popped over a jump, Aero trotting happily beside me. We jumped up and down a step, we went over another jump. Aero had his serious face on the whole time. There was a U shape set up with poles on blocks, that you’re meant to reverse through. We went through it forwards once, and then reversed through it. He clonked a pole while reversing, but he stayed attentive throughout. I remembered one of the exercises the Elite horses were asked to perform at the National Championships – side pass over raised poles. The U shape seemed like a good opportunity to try it out. Aero was super – he side passed along the long side of the U and carefully negotiated his way around the corner before side-passing along the short end. 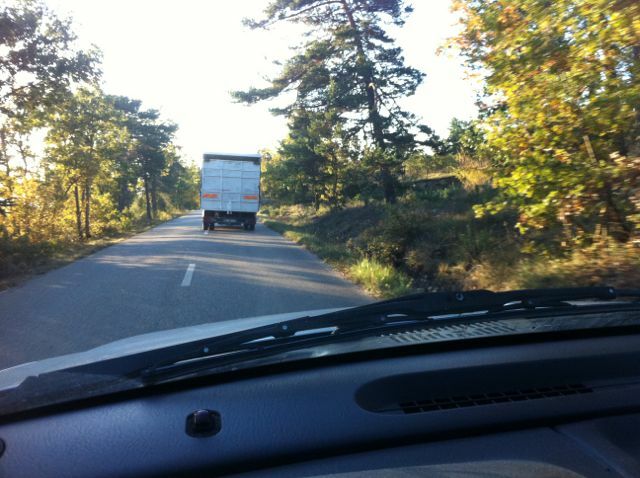 I felt that was more then enough and I invited him forward rather than asking him to continue up the other side. Alexandrine had been watching and she gave us a thumbs up. That meant more to me than anything G had said! 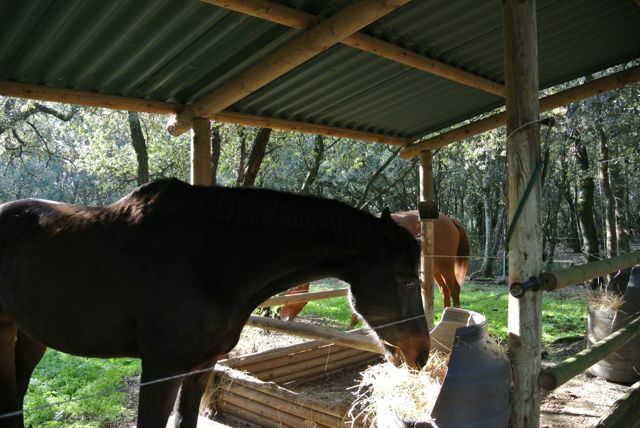 We finished up letting our horses graze in the weak evening sunshine for ten minutes, as a reward for their hard work. 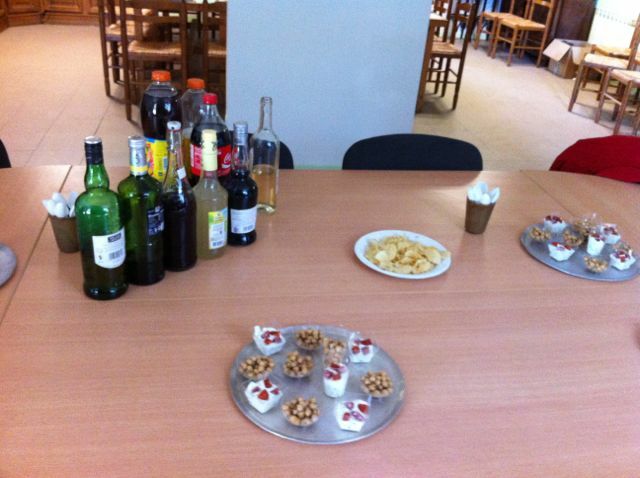 Then it was back to the reception area for yet more food – a farewell drink with nibbles once again. The three of us – Alexandrine, MC and I – discussed the clinic as we packed up our gear. They both felt it had been an expensive way of getting their horses out to a nice arena and practising some stuff. 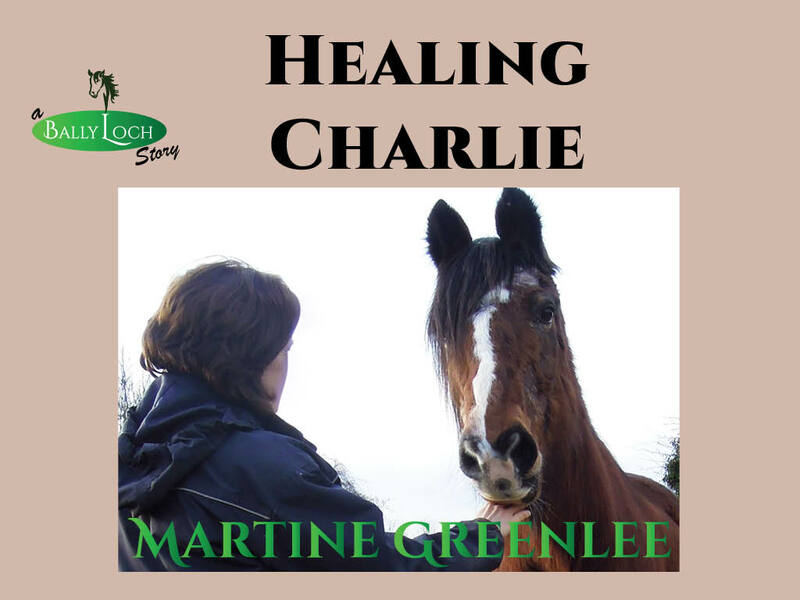 They are so advanced that G really has very little to teach them – he had been unable to offer Alexandrine any helpful advice on what to do with Valentine when she got herself all wound up on the lunge, for example. It was their third clinic with G and they both felt that they’ve learned all they can from him. Alexandrine, in particular, felt he had been less than attentive with her – she reckoned she’d had maybe twenty minutes of his undivided attention over the entire seven or eight hours we’d been with him. Not good when you’re paying over €250 for the clinic! At least I felt he had helped me a lot with the work on a circle. But, to be honest, I could have learned that working with Alexandrine and paid a lot less. Still, it was an experience. My first Stage. And all in French, too. But we didn’t learn any circus tricks! PS I will hold the draw for the sheet of WEG 2014 commemorative stamps first thing tomorrow morning, with the LSH as my witness! It’s not too late to like/comment on THIS POST if you want to be included. The French natural horsemanship movement picks pages out of all the big name NH trainers’ books, then they package it up and call it Equitation Ethologique! 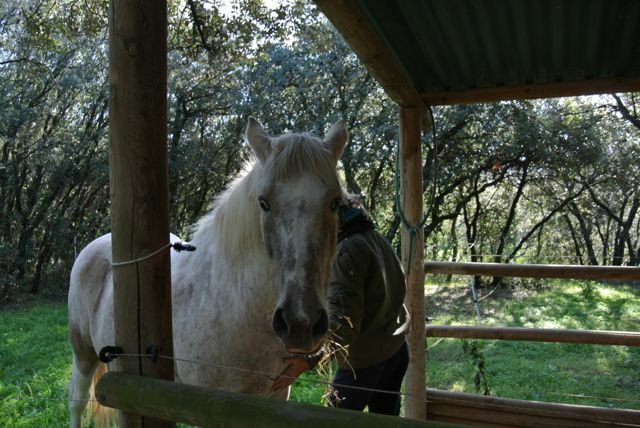 Parelli methods are popular here; yet many people say they don’t like him. Monty Roberts is very much out of favour! Clinton Anderson is probably the Ozzie you’re thinking of, he’s popular here, plus Andy Booth who lives in France (Alexandrine trained with him). I wouldn’t say Aero is at the highest level, we do have our issues… he’s still actually fearful of the whip, which I only realised when I was working him at home last week. Need to desensitise some more!